Now that we have the Android SDK and PhoneGap installed, (and our PATH variable updated), we need to create a device emulator that will allow us to test our code in a simulated environment. Skins: HVGA (default), QVGA, WVGA800, WVGA854 id: 3 or "android-7"
Take note of the ID string listed in the output for Android 2.1 (i.e., android-7). This SDK is the most widely deployed platform at the time of this writing. Here we're telling Android to create a virtual device (avd) with the name (-n) "mySim" that targets (-t) the android-7 platform. When asked if you want to configure custom options, just type no and press Enter. The process should only take a few seconds and when it's complete, the emulator is installed. 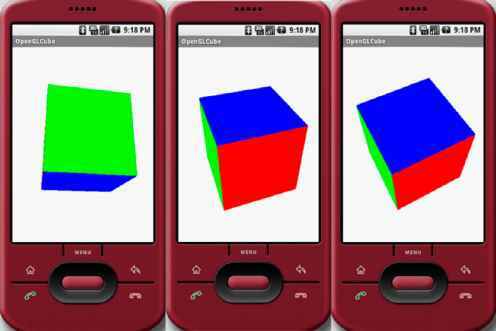 Here we're using the emulator command to launch the Android Virtual Device that we just created. The -avd flag is followed by the name you chose when creating your AVD in the previous step. 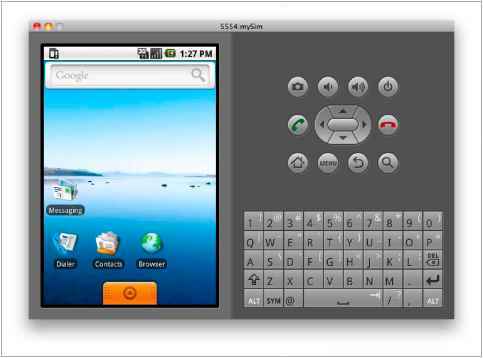 Wait while the emulator initializes and eventually displays the phone's home screen (Figure 7-6). The first launch can take a minute or two, so be patient.